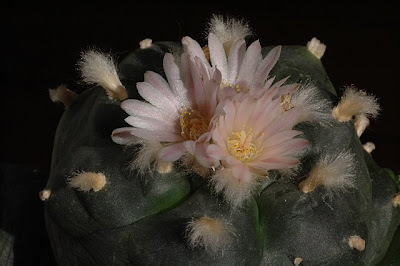 I’ve previously made an attempt at a stop-motion video showing the thigmotropic behavior of Lophophora stamens. It so happened that the Lophophora williamsii var. 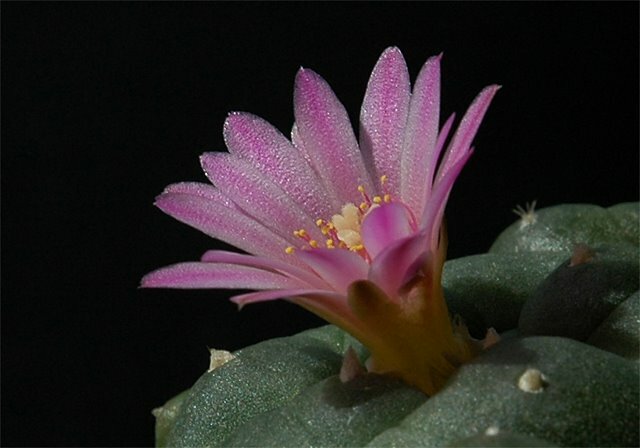 jourdaniana plant flowered again during my summer vacation, leaving me plenty of time to experiment with time-lapse videos. The above video covers a time span of approximately 90 minutes, i.e. playback is sped up by a factor of 150. 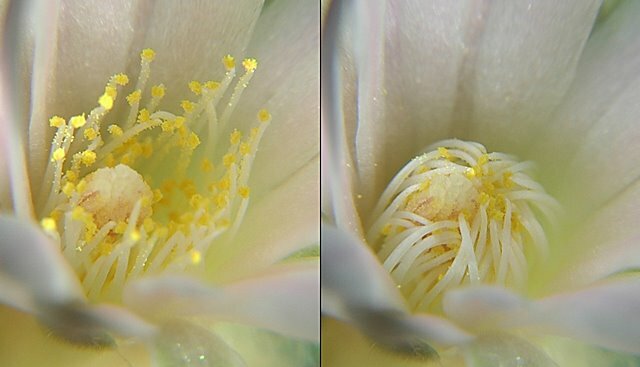 This is my first attempt at a time-lapse “flower movie”, as can be seen by the quality of the film. The first 11 seconds were shot while the camera was in auto-focus mode, resulting in a “wobbly” feel. I then disabled auto-focus (and lost a couple of frames in the process, which can be seen as a “jump” 11 seconds into the video) and later had to re-focus (28 seconds into the video), so it's not perfect, but not bad either. The frames were shot with the sun as the only source of light. Next, I wanted to make a better (i.e. 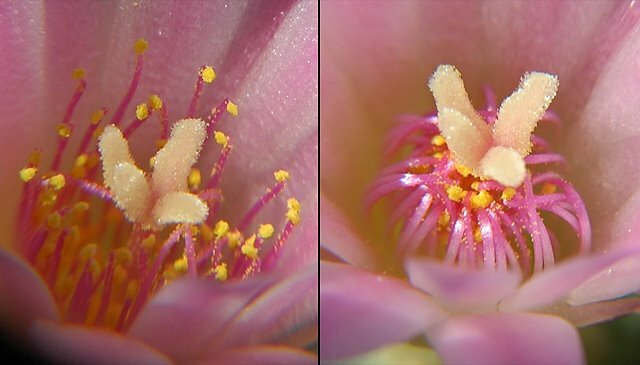 more frames per second) version of the thigmotropic stamens video but ended up with a version looking a lot like the original one. I guess the last 2 clips would be more illustrative if they had been filmed with a regular video camera instead of an SLR, but they’ll have to do for now. 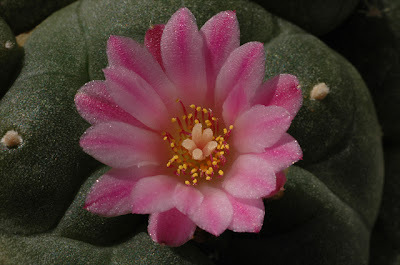 Unfortunately my camera ran out of power effectively putting an end to the filming of this particular flower. Finally I have to mention the Hydrocactus – cactus video page as the main inspiration for these experiments and the best source of cactus videos I’m aware of. 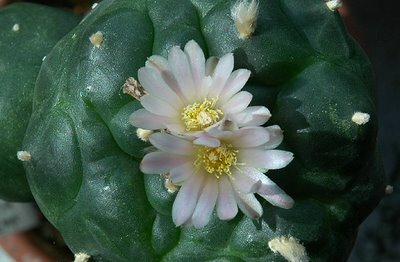 According to Habermann’s description Lophophora williamsii v. jourdaniana differs from other L. williamsii varieties by having rose-violet perianth, pistil and filaments as well as having small persistent spines on young areoles. 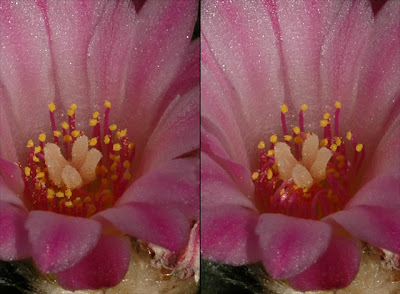 Like L. williamsii v. williamsii the jourdaniana variety has thigmotropic stamens, i.e. stamens that when touched fold in around pollinating insects or the style. I wonder if this mechanism is used for actively depositing pollen on pollinators or for avoiding self-pollination (or both)? 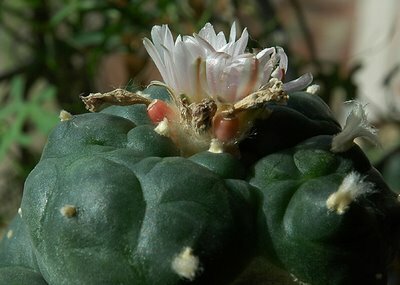 The flowering of this plant coincided with the flowering of my grafted Lophophora williamsii (SB 854; Starr Co, Tx). 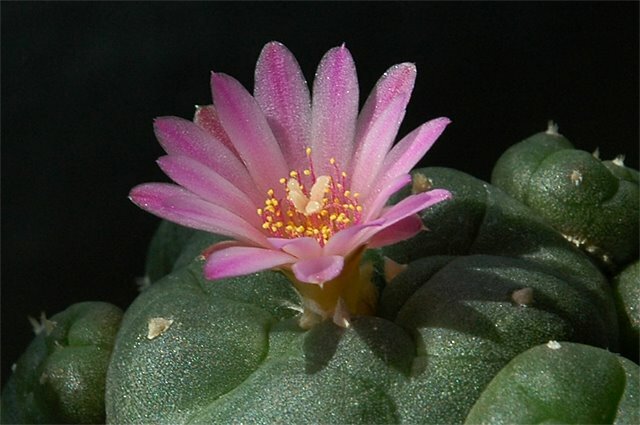 I decided not to outcross the plants but instead self-pollinate both of them; first of all to keep my SB 854’s “clean”, but also because I want to test the alleged self-incompatibility of the jourdaniana variety. This Lophophora williamsii v. jourdaniana plant also flowered last year – it was then outcrossed with pollen from a regular L. williamsii and yielded 2 seeds.